Preheat the oven to 425°F. Trim the eggplant and slice into ½ inch thick rounds. Sprinkle each side with salt and lay on paper towels to draw out the moisture. Drain the tofu. Zest and halve the lemon. Mince just 2 cloves garlic. Add the sliced eggplant to a baking sheet and toss with 2 tbsp olive oil. Roast in the oven until lightly browned, about 18 to 22 minutes. Add the tofu, lemon zest, juice from half the lemon, remaining garlic clove, dried oregano, ½ tsp salt, and a pinch of pepper to a food processor. Blend until smooth, scraping down the sides of the food processor as necessary. Place a small saucepan over medium-high heat with 2 tbsp olive oil. Add just the minced garlic and cook until fragrant, about 1 minute. Add the fire roasted tomatoes, ¼ tsp salt, and a pinch of pepper. Bring to a boil, reduce heat to low, and simmer until slightly thickened, about 3 to 5 minutes. Place a large skillet over medium-high heat with 1 tsp olive oil. Add the baby spinach and cook until wilted, about 1 to 2 minutes. Halve the ciabatta and pop in the toaster or oven until hot and crispy, about 2 to 3 minutes. Place a slice of roasted eggplant on each plate and top with the tofu ricotta and then the sautéed spinach. 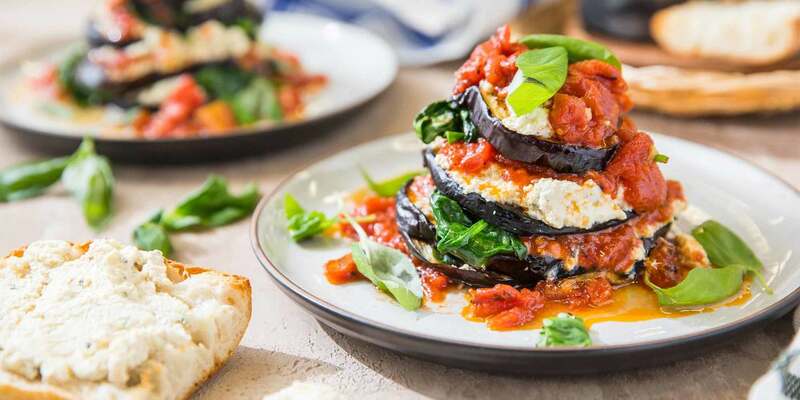 Top with another layer of eggplant, the fire roasted tomato sauce, and continue to layer all four ingredients until all of the eggplant is used. Top with any remaining sauce and hand tear basil leaves over the dish. Serve with the toasted ciabatta.